Voice your opinion! Review HEX Business Services LTD now. Beautiful design. I had to expand our business with some web mechanisms and decided to do it with web site. To get in touch with my customers easier. They built my web site amazing. Is HEX Business Services LTD your company? 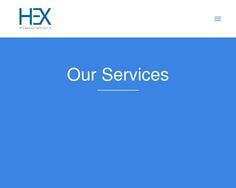 HEX Business Services is a creative design agency that deals with web design, marketing, IT and hosting. keeping the customer at the heart of our business.